Loloz – A Cavity Preventing Lollipop? Hi everyone! I wanted to use this week’s blog to introduce you to a new product on the dental market that advertises its ability to help prevent cavities in children and adults. This product is called Loloz and is manufactured by Healthygrid. Before I explain Loloz and how it is proposed to work, let me provide some background information on dental cavities (caries). As reported by the CDC, the most common chronic disease in our nation’s children is dental caries, and over 28% of children will have cavities by the time they attend kindergarten. Dental caries can cause pain, infection, loss of function and can negatively impact communication, learning, eating and other activities that aid in normal growth and development. This is astounding! The development of dental caries is a complex, multifactorial process and there is still much to learn about the disease. Some things that are known for certain about the development of dental caries are the key players that must be present in order to develop caries: 1) a susceptible host and teeth; 2) refined carbohydrates (sugar); 3) the presence of bacteria; and 4) time. Put simply, if we are missing one of these key players, then caries can not develop. Loloz may help prevent cavities by working to eliminate the presence of bacteria in the mouth. 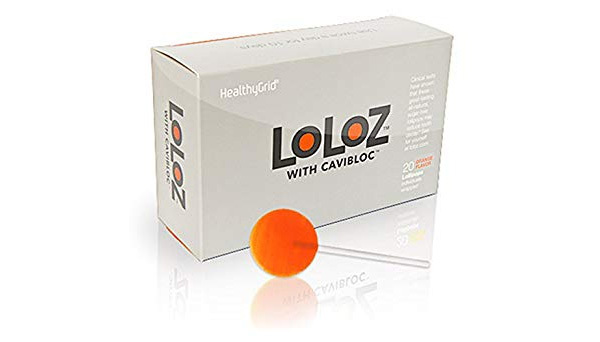 Loloz are lozenges and lollipops that contain Cavibloc which is a patent-pending formulation of licorice root extract, that helps kill three of the major types of bacteria involved in the formation of cavities—Streptococcus mutans, Streptococcus sobrinus, and Lactobacillus. The recommended use of Loloz is to consume 2 lozenges or lollipops for 10 days, 2-4 times per year. According to the manufacturer of Loloz, this regimen can help reduce the presence of bacteria in our mouths and aid in cavities prevention. Laboratory studies have shown that a 5-minute exposure to Cavibloc, the active ingredient in Loloz, can kill 99.9% of S. mutans in saliva. Loloz was developed by a team of microbiologist from UCLA. Loloz is available in berry, orange and lemon flavors. It is still recommended that individuals that consume Loloz maintain good oral hygiene, proper diet, and regular dental visits. Our office will be testing Loloz, on a trial basis, so we should have them available to our patients/parents…if you’re interested in giving them a try, let us know. It is often difficult to get children to be compliant with oral hygiene and multiple oral health products; perhaps the consumption of lollipops will help motivate your child. At our office, we strongly encourage and promote good oral health and caries prevention by providing our patients with education, quality treatment, and oral healthcare products proven to be successful. We hope the results of Loloz stands up to its preliminary laboratory and clinical research and is a product we can add to our repertoire to help prevent cavities in our patients.